Creating fast-charging electric cars is a double-edged sword. On one hand, reducing recharge time down from hours to minutes is a crucial step toward making EVs attractive to consumers — no one wants to wait around at the pump for an hour and a half. But research has also found that quickly recharging a car’s battery hinders its performance. Companies like Tesla and Porsche are at the foreground of solving this problem, making a point of trying to lure consumers to their EVs by boasting “ultra-fast” charge times. But speeding up the recharging process of lithium-ion batteries creates a chemical reaction, known as lithium plating, that can drastically deteriorate a car’s battery over time. Fortunately, a group of American scientists have harnessed the power of X-ray technology to better understand the phenomenon in order to develop better batteries in the future. The study, published in the journal Energy & Environmental Science, specifically examined coin-cell, rechargeable lithium-ion batteries with graphite electrodes, or the positively and negatively charged components of the cell. By using a technique known as energy dispersive X-ray diffraction, the researchers were able to capture a “movie” of the batteries beginning to malfunction during fast charging. This gave them a clear picture of how lithium plating might occur in the much bigger cells that will eventually be used to power cars and smartphones. 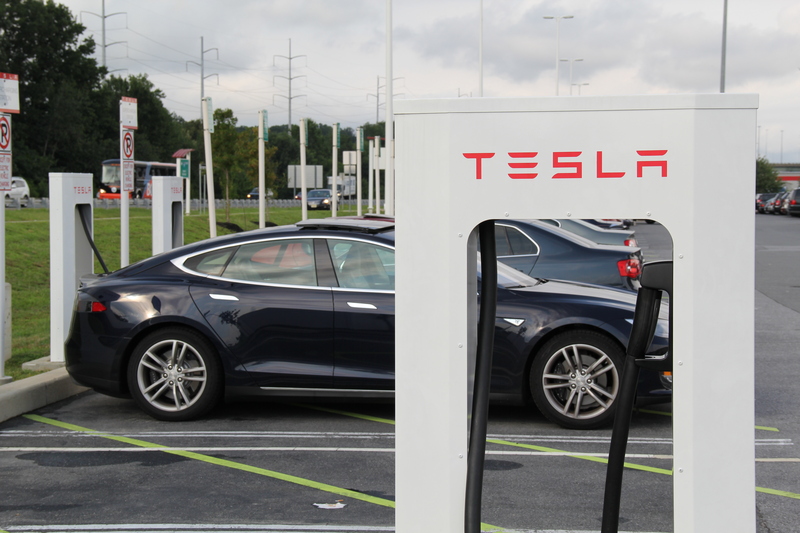 A Tesla's Superchargers could actually be quickly deteriorating your EV's battery. The researchers also found that the electrolyte — or the liquid in lithium-ion batteries that carries charge between the electrodes — tends to solidify near the separator, a membrane between a cell’s electrodes. Daniel Abraham, a battery scientist at the U.S. Department of Energy and co-author of the study, explains how this gave the researchers a better understanding of exactly what causes this rapid deterioration. It turns out that lithium causes graphite’s crystalline structure to expand, leading to a small deposit of metal near the separator. After a while, this build-up begins to interfere with the overall capability of the cell, reducing a car’s range or a phone’s total battery life. 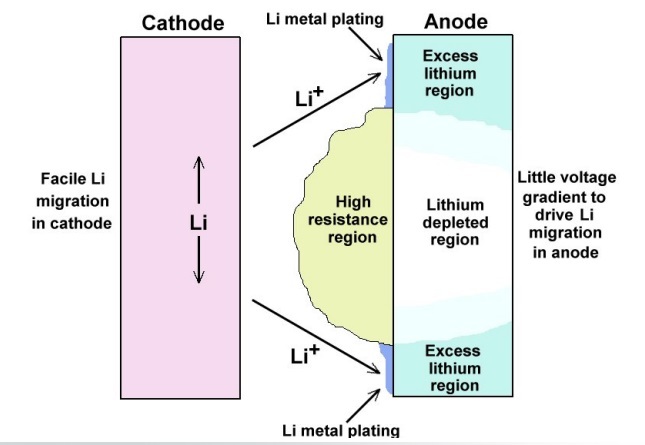 A diagram of a lithium-ion battery undergoing lithium plating. Currently, the only way to prevent lithium plating is to avoid over-voltage, according to the UPS Battery Center. That isn’t exactly a compatible with EV industry’s mission to some day fulfill our fast-charging dreams. But this could be solved if battery scientists figure out a way to replace graphite with a less crystalline material. Now that Abraham and his colleagues have figured out how to observe lithium plating, they intend to study larger pouch-cell batteries found in EVs and smartphones. This way they can work toward specific solutions to create long-lasting batteries that can also charge rapidly, a development that, once achieved, would be sure to send shockwaves across a number of industries.